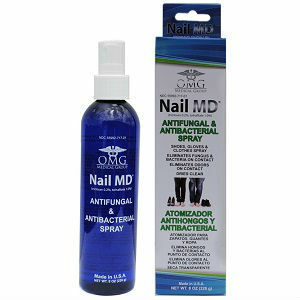 OMG Medical Group Nail MD Spray is an antifungal and antibacterial spray. This product helps to eliminate nail fungus and athlete’s foot. It can also can reduce cross contamination from infected footwear, gloves and clothes. OMG Medical Group Nail MD Spray is also registered with the Food and Drug Administration. The product source does not list product ingredients except to say that their product is an antifungal and antibacterial spray. The product is sprayed on although the product source provides no specific information about product application or dosage. The product price is listed as $24.95 for a spray bottle although information about product container size is not provided by the vendor source. The product source contains no information about product returns or guarantees although the product vendor’s web site home page does provide a contact number. The product source contained no customer reviews and only limited information about return policies, product application and ingredients as discussed above. Any one seeking to buy this product should contact the vendor to fill in missing information before making a purchase. Jack Stevens	reviewed OMG Medical Group Nail MD Spray	on January 13th	 and gave it a rating of 4.